I just discovered something that simultaneously gladdens and frustrates me. It frustrates me because it’s like discovering an amazing shortcut to work that shaves 15 minutes of stop and go traffic off the drive after you’ve been driving the same route for 5 years. Why didn’t I know this sooner? It gladdens me because I have discovered and easy way to make butter taste even better! Yes, butter. Taste. Even. Better. It all started because artichokes are in season here and I have been taking advantage of their abundance and the fact that we can now both enjoy the labor-intensive ritual of dipping the petals into something delicious and scraping off the flesh between our teeth. I’ve been steaming them or steaming them first and then splitting and grilling the halves. I usually make a lemony mayonnaise, maybe something with capers or an aioli, but was in the mood for something simple and easy. I had butter in the fridge (of course) and decided to try making clarified butter. 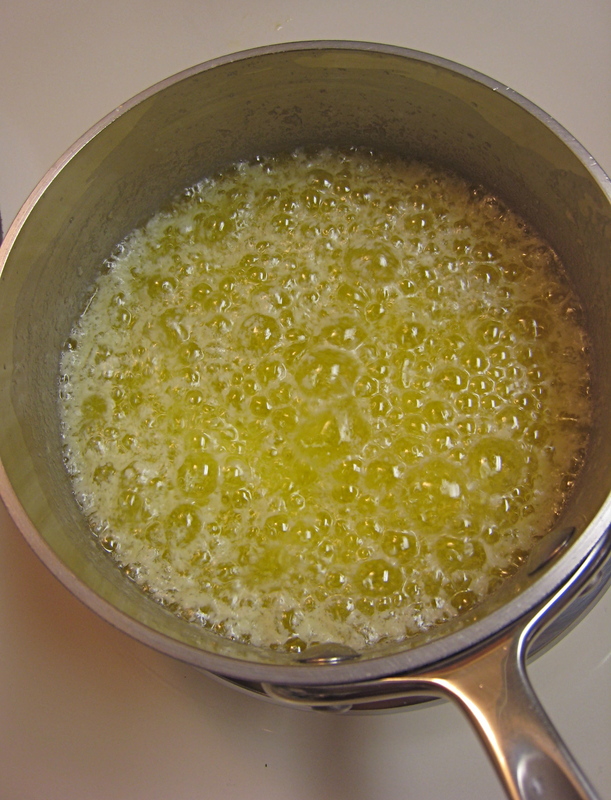 Clarified butter is butter from which the milk solids and water have been removed by boiling and straining or skimming it. 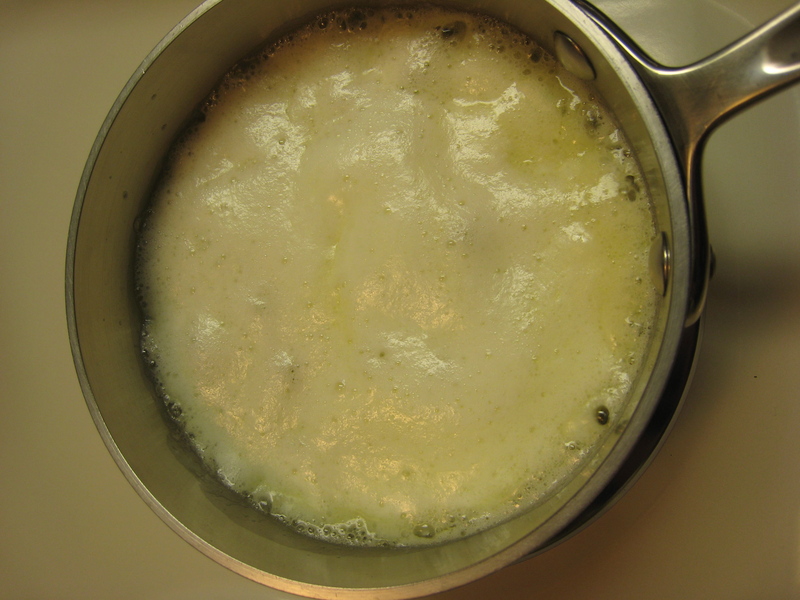 Taking the process one step further and carefully browning the milk solids before separating them produces ghee or beurre noisette (brown butter). 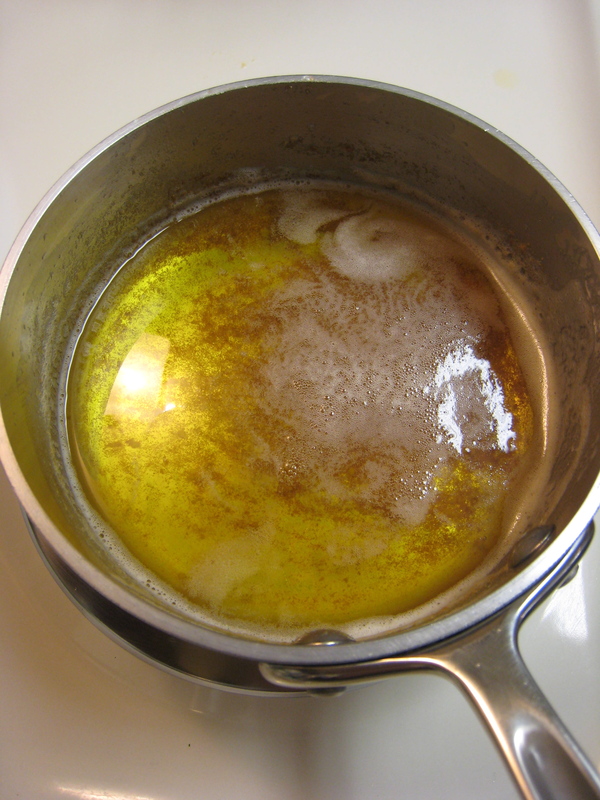 Clarified butter has a very high smoke point, perfect for frying or sautéing vegetables over high heat. But just like other foods whose flavor is enhanced by toasting or caramelizing, browned butter is butter intensified, the butteriest of butter flavors. 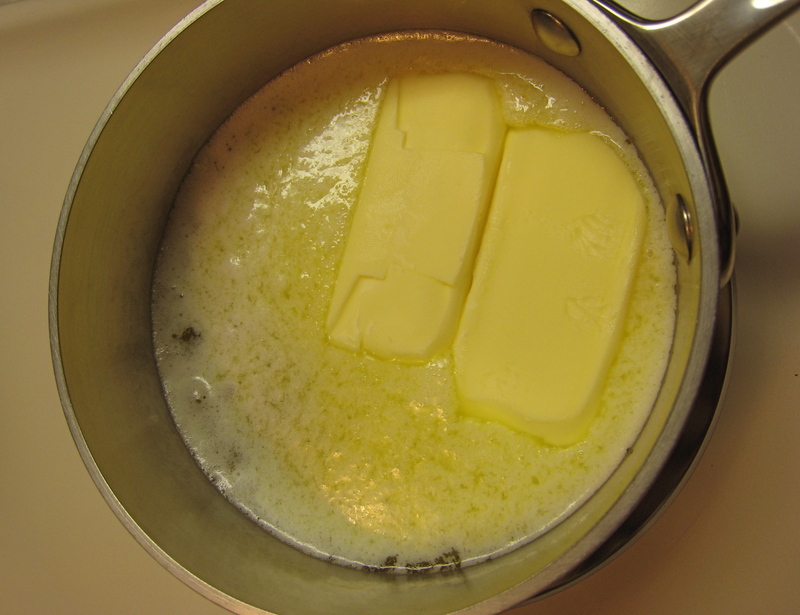 Grab a couple of sticks of butter (it keeps well, so go ahead and make a lot) and a heavy bottomed pan. This is really the only touchy part of this procedure- you really don’t want it to burn, so a heavy pan and a watchful eye will be important. It will foam up and steam- this is the water cooking out of the emulsion. The top will begin to be covered with foam as the milk solids then separate from the fat. Give it a stir and see if there is a layer of white on the bottom as well. When the white milk fats have separated from the yellow fat and the fat is transparent, take it off the heat and scoop the opaque top layer off, pour the clear layer into a clean jar or ramekin, leaving the white solids in the bottom. 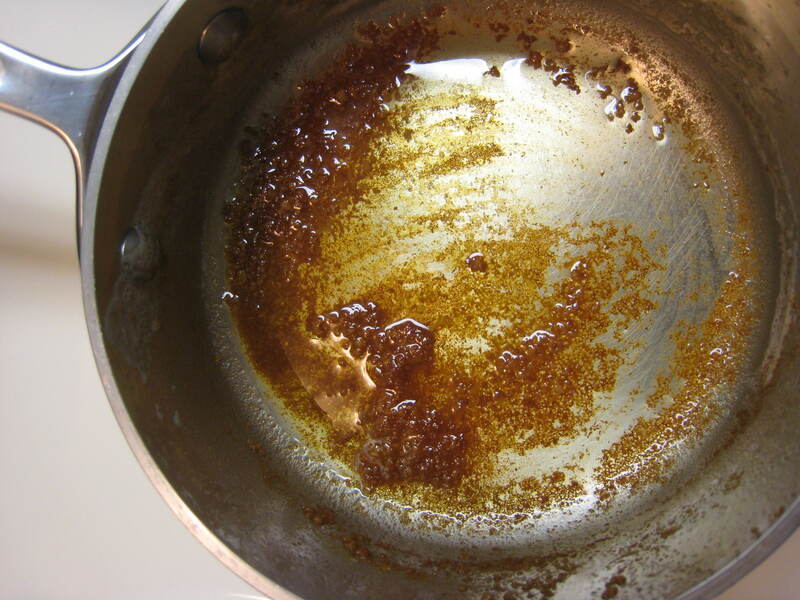 This is clarified butter. If you want to take it to the next level, leave everything to gently cook in the pan until the layer of solids on the bottom is golden brown and the butter starts to smell like popcorn. I can’t tell you how delicious this is. You really have to try it to understand why I’m so excited about how easy this liquid gold is to produce. Dip a spear of asparagus into it and you’ll see what I mean. Artichokes and beurre noisette are an unmitigated pleasure. It’s the little things, really, that make me the happiest. It’s ways of bringing out the best in the simple pleasures of life. And I mean, come on, it’s even better tasting butter. So decadent, but oh so good. I caught that “the fact that we can now BOTH enjoy…”. 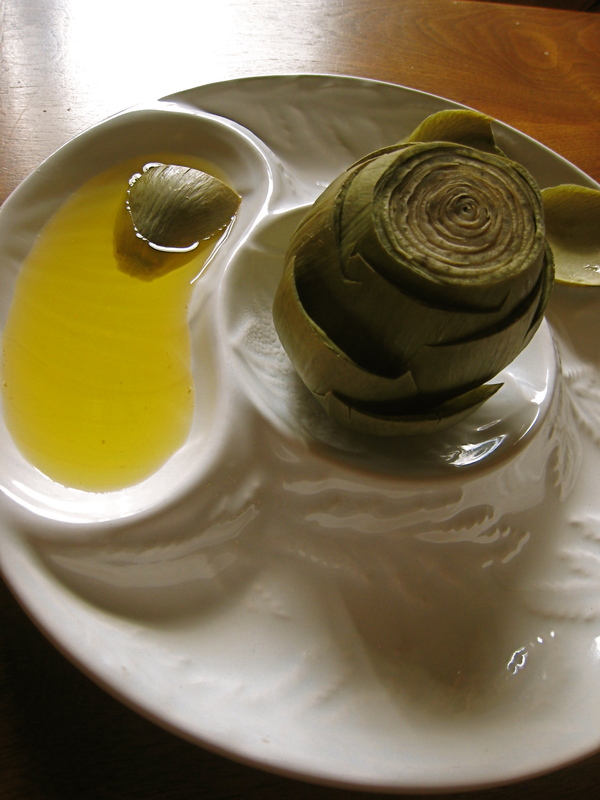 The yellow liquid in the beautiful photo with the artichoke is clarified butter without the solids, right? If you left it all in the pot and browned it as suggested what does it look like? How brown? steam say three of them? The butter in the artichoke photo is what I separated from the browned milk solids in that last photo. The fat doesn’t brown, but the flavor infuses it. The milk solids are what gets brown. No vinegar in the steaming water, just salt and water for 20-30 minutes. Maybe I should do a post about how to cook artichokes?